Holy Cow! 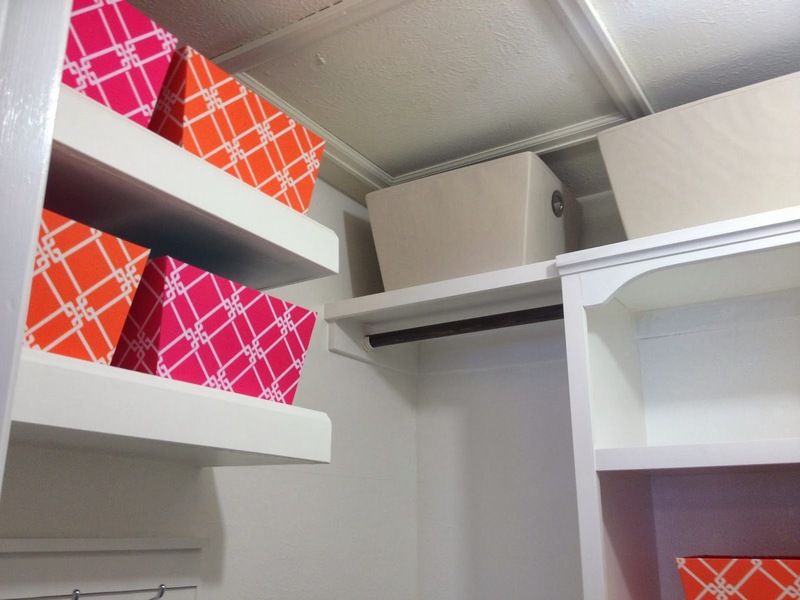 I am so so so excited to finally show you my new master closet! Seriously, this super exciting because I LOVE it! And so does my husband, and even my kids are now asking which of their closets is next! It makes all those hours of hard work totally worth it! So exciting right!? It is even better than I imagined, with only minor adjustments to my original Plans. 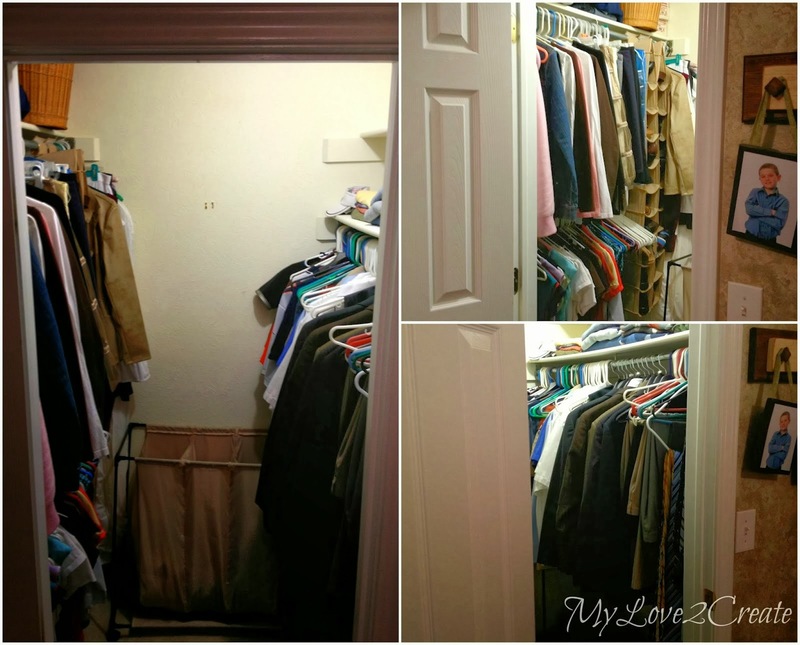 It is so hard to photograph inside this closet because it is so small, so I thought I would start with some before and after shots from different angles. Here is looking into the left side of the closet. This is the right side of the closet, and sorry, some of the pictures are just what they are...lights had to be on, no windows in this closet. Here is another shot of the right wall, from inside the closet. Hard to believe it is the same room. 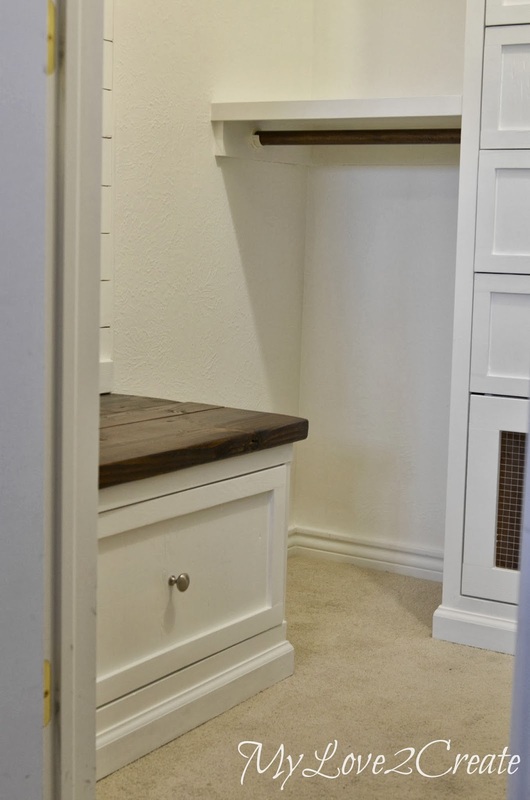 I wanted a little "mudroom" type area, for sitting and putting on shoes and hanging clothes/jackets/purses in a quick hurry. So this is just inside the door of the closet to the left, and I am so happy with how it turned out! See the clothes hanging on the hooks? Those are work out clothes, mine and my husband's. They just need a little dry time before they go in the laundry, and the hooks have been awesome! What do you think of my hamper drawers? They hold a full load of clothes, and look cute at the same time! I wanted them to be able to get some air, hence the metal "hardware cloth" fronts, and I love that I can see how full they are so I know when it is time to wash! Of course I had to add some fun chalkboard labels...who said you can't have some "cute" in your closet! And if you are wondering, I will still be writing a post on the finishing touches to my closet since my last post, I just had to share the reveal first, I couldn't wait! See how full my whites are? Well, that is because my washer broke, again, and it didn't get fixed until today, and it is also why my husband has only a couple of white shirts hanging up, most of them are in the hamper! See, only two white shirts, he wears them every day so there are at least 7 in the laundry! Yes, go Broncos, we still love you... This curtain tie back became a last minute addition to the closet, when we were finally putting in our clothes. 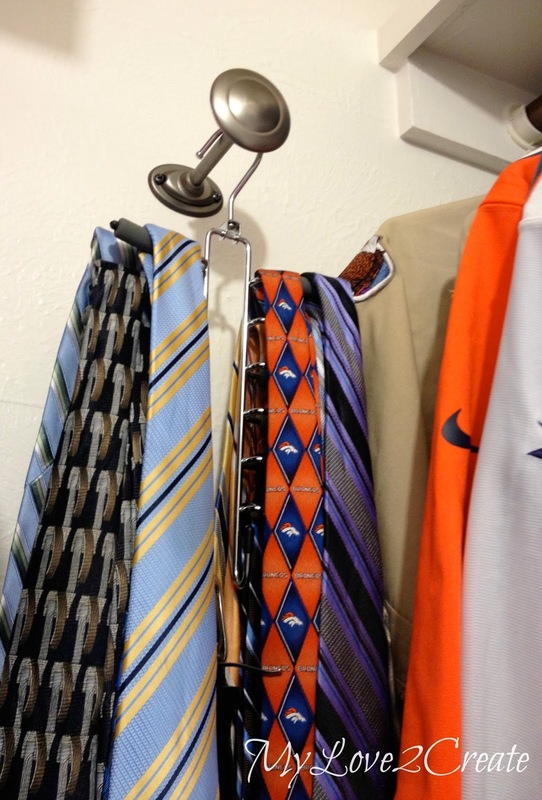 My husband decided he DID want to hang his ties on the wall after all, and it took only a few minutes to install, it works perfect! At my husbands suggestion I made the bench with a drawer instead of a bench with roll out crates, I am so glad, it is one of my favorite parts. I got some beautiful wood tones in here with all the white, it makes me happy! I finally found an excuse to do a plank wall too! I LOVE it! It is even cooler because the whole plank wall cost me .51 cents. Yep! Months ago I found a 1/4 in plywood half sheet in the cull bin at Home Depot, they cut it down into 3 1/2 inch strips for me because I thought someday I could use them...and this was that day!! I tried my first floating shelves and they are so awesome! I also added my pop of color with these cool clearance bins from a new store down the road called Garden Ridge, it is a super fun store. They keep my stuff organized and look cute at the same time! This bin is on my tower, and it holds my cami's quite nicely. I also have tons of storage in these bins on the top of my shelves and towers. They are great! 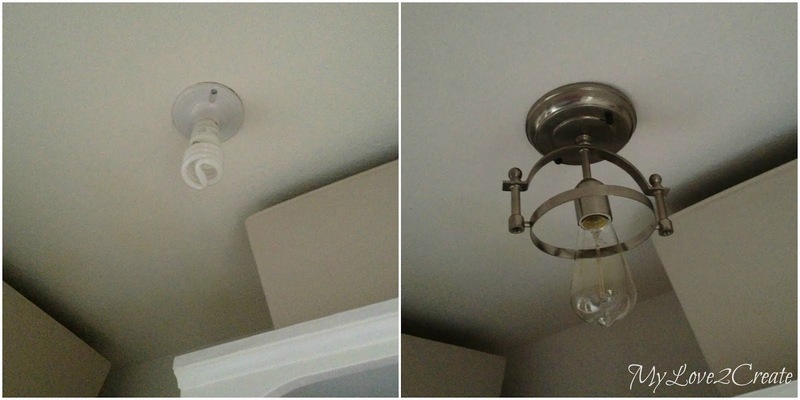 Oh, that reminds me, I had this light fixture that I got at the restore forever ago...it was only $2. Way better than the old one! And I know it should have some type dish or something that attaches to it, but I liked it just the way it was, and the price was right. That sign describes how I feel to be done with this closet. If you have seen the preview to the new Lego movie, it is from a song in the movie, and we have been singing it constantly! The letters? My husband's and my initials...ahhhh. And that is it!! 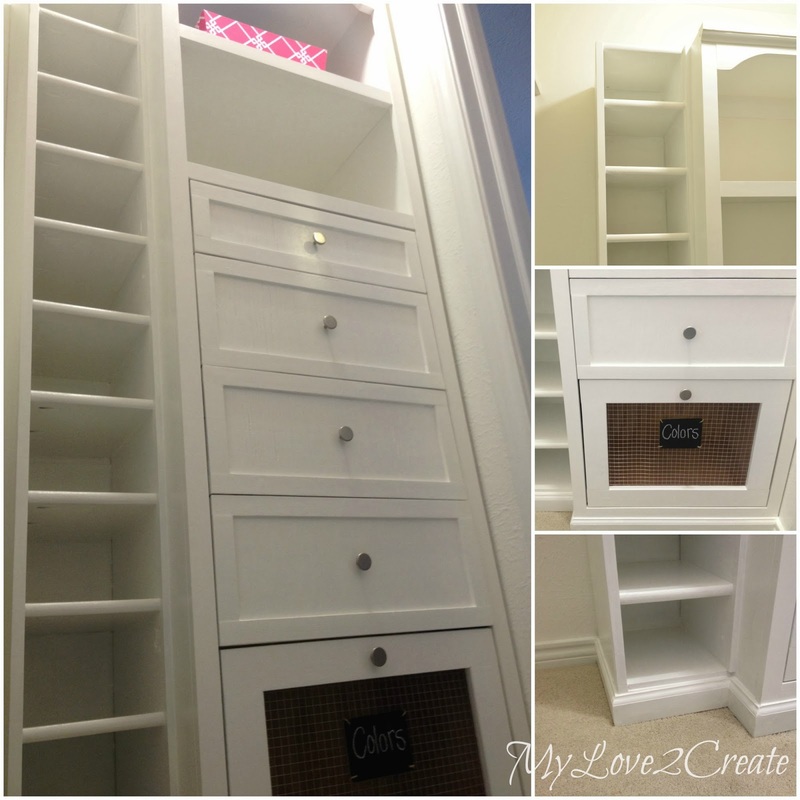 I have really learned a lot doing this closet, and I can hardly believe I DIY'ed it, ALL BY MYSELF! It makes me realize that you will never know if you can do something unless you try. And believe me I had my moments of wanting to quit, but I would just plug along every day, even if I only sanded or caulked or cut wood... The biggest thing I learned is that "by small and simple things are great things brought to pass" and I know some of you have heard that before! Turns out it applies to big projects as well as our daily lives! *Update* The Final Touches Post! I also want to point out that I am not including things I had purchased previously and used, such as the paint, light fixture, one 14" drawer slide, screws, spackle, plank wall (like .51 cents makes a difference, lol), hooks, and a TON of scrap/reclaimed wood (I am a craig's list free section addict), metal "hardware cloth", paint brushes/supplies, one knob, etc... They were things I already had on hand, but still got a good deal on, or got for free. Grand total spent: $305.74!!! !.....AND, a lot of hard work! Not bad eh?!! So, do you think it was worth it? I want to hear!! Go Seattle! Ha! Just Kidding. I am actually not a football fan (gasp) but I am a Denver transplant from Seattle. Okay, now you better be in bed. I know you posted this post super late. lol Wait, I better go to bed. Oh Mindi, your closet is beautiful!! Love the little sitting bench!! This is seriously amazing, Mindi! I would be incredibly happy if a ROOM in my house looked like this, let alone my closet. I am blown away by the 50 cent plank wall and two dollar light fixture too. Please teach me your thrifty ways. I'm so impressed with how well you put that small space to work. Well done! Wow wow wow. First off, you should be SO proud of yourself for tackling this! Second, your budget was fantastic and it is amazing how great it looks. I would have thought it was waaaay more expensive than that. Third, I LOVE the hampers. Love them!! What a beautiful job! 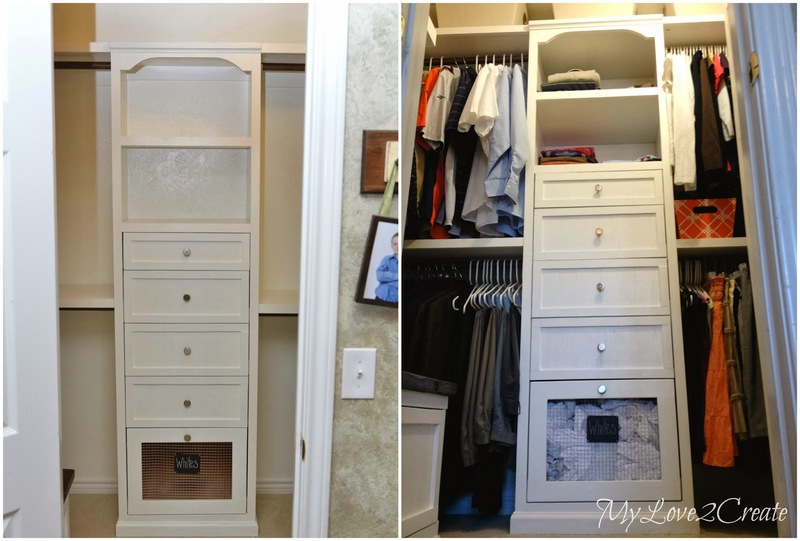 This is a beautilful closet makeover and can't wait to try something like this myself... So glad I found you through Kim Six Fix. Following now!! Hopefully, I will take before and afters and do a post on mine!! Thank you for the great inspiration!! What a great transformation! 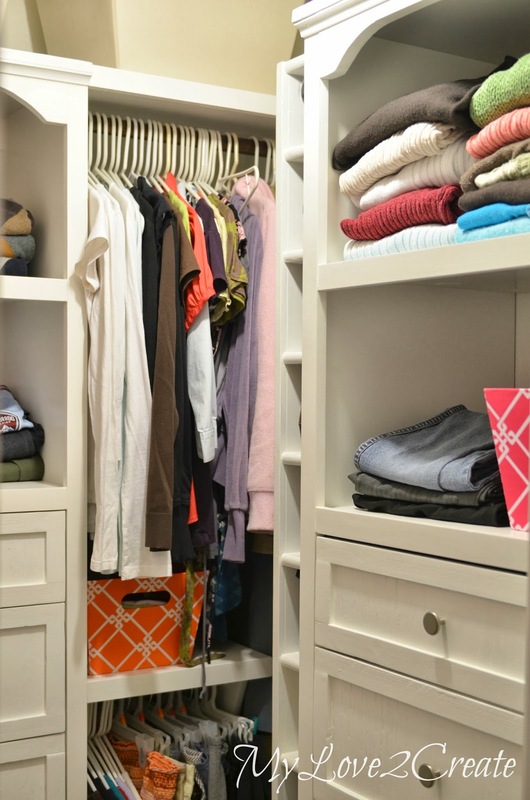 You used every inch of space inside that closet and made it count. Would love for you to share at Fridays Unfolded! Love how it turned out & the little details that make it FABULOUS! Pinned! 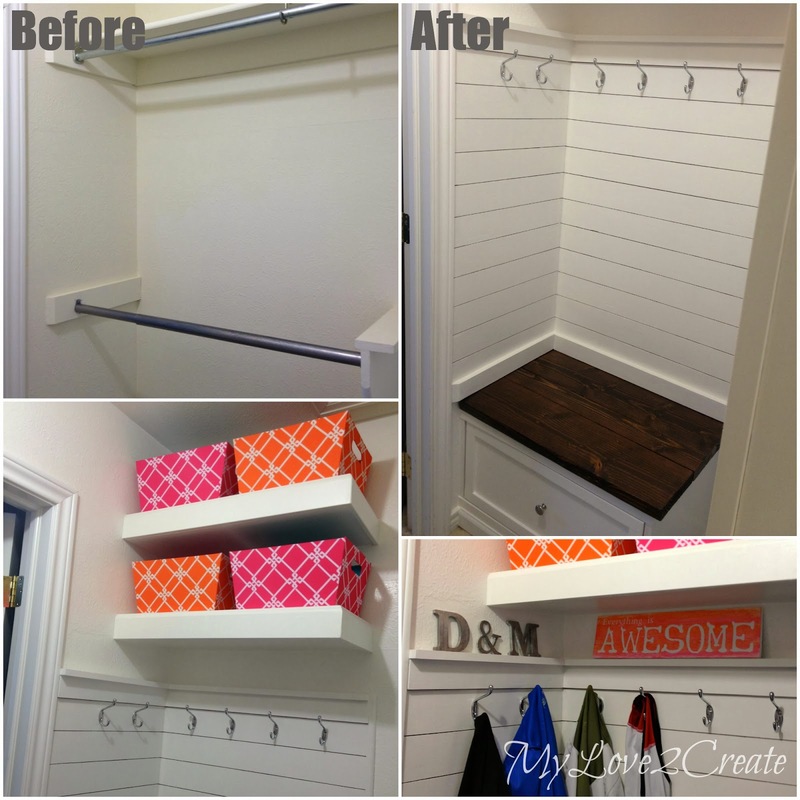 What an amazing closet makeover! I bet you smile every time you go in there. I absolutely love this! You are so talented. Great job!!!!!!!!! Oh my gosh! it's fabulous Mindi! My faves? the wood tones, hampers, hooks, bench! ohhh, you did a fabulous job! big pat on the back girl! This is outstanding! You did suuuuuuuch an amazing job! Mind=blown! Can you plan my closet for me? (I'm half joking... but if you wanna collaborate, wink-wink). I love how this turned out! It's so clean, fresh and organized! 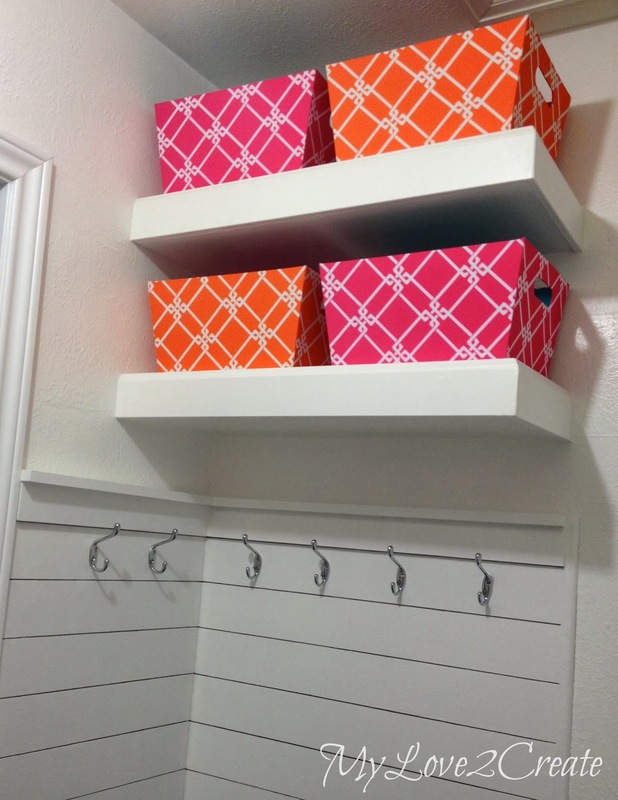 I love the pink and orange baskets and the punch of color they add to the closet! I would love to have this for my own closet! Wow, Mindi!! I popped over to your blog from Ana White, and voraciously read every chapter in your build. 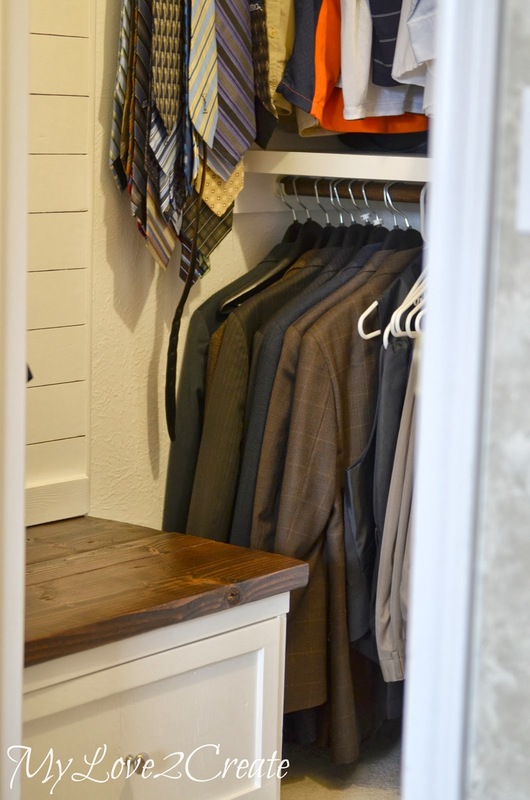 You have really inspired me to do something very similar in my husband's closet. 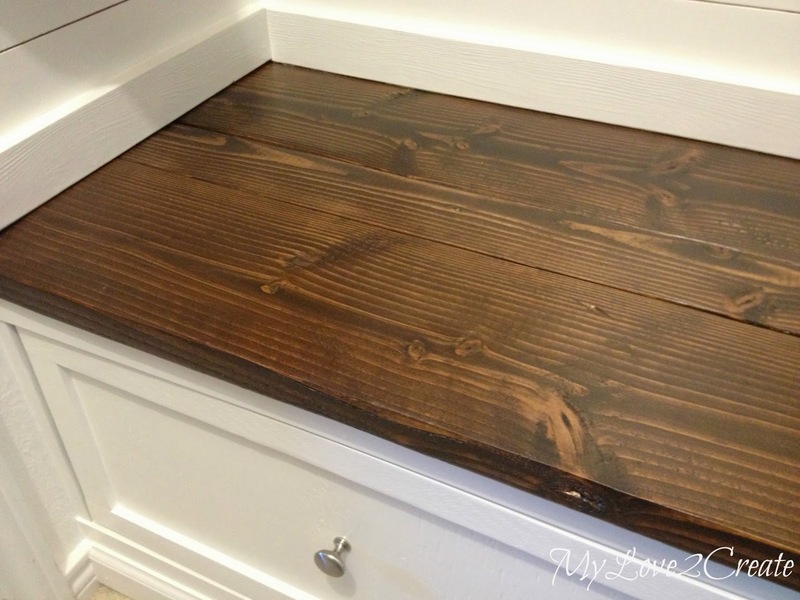 I really love your idea of the little bench and the pop of dark wood tone sets off the white wood beautifully. One question, if you have time to answer...how did you secure the metal cloth to the drawer so that it doesn't snag on your clothes? I'm sure you covered it some way. Thanks again for the inspiration! Thanks so much Linda! That is a great question, I have one last post on the building process that I will be posting next week that will cover how I did the drawers faces (hampers included), I got excited to post the reveal and did that first, I guess I should have waited! That's great! I'll be looking for your post on the drawer and hamper faces. Thanks for the quick reply, too! I love this!! Where do I even start? I love the bench, the drawers, the laundry spaces...it's just perfect...you thought of everything! Visiting from LOBS and so glad I did! I am pinning this...in hopes I can do the same some day! I think it was definitely worth it! I LOVE it!! 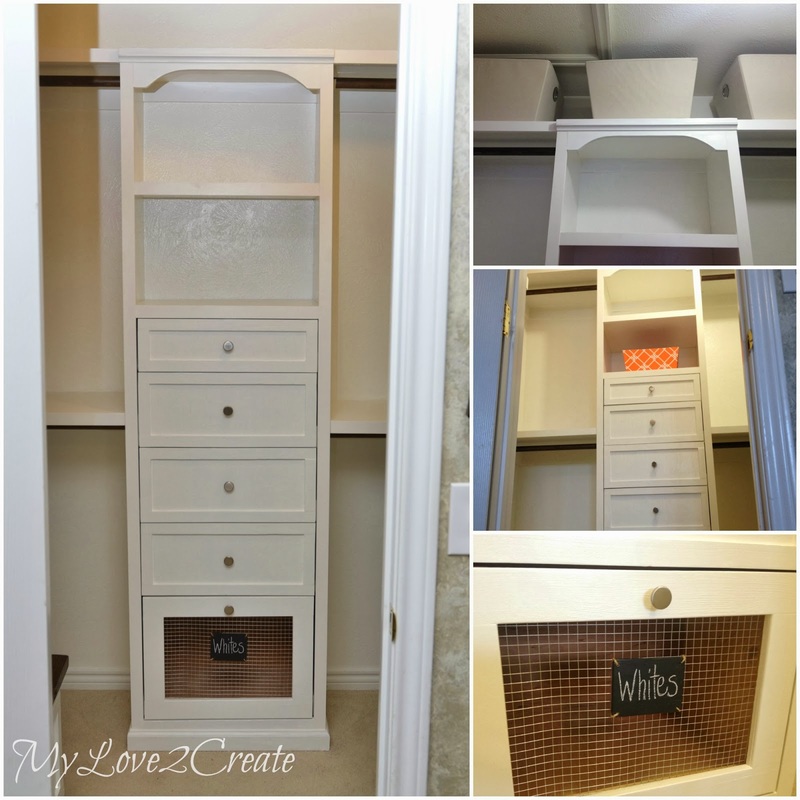 You are so creative, I wish you would do my craft closet...it's in need of some TLC! LOVE Garden Ridge...there's one right down the street where I live and I always love going there....I could spend hours there! 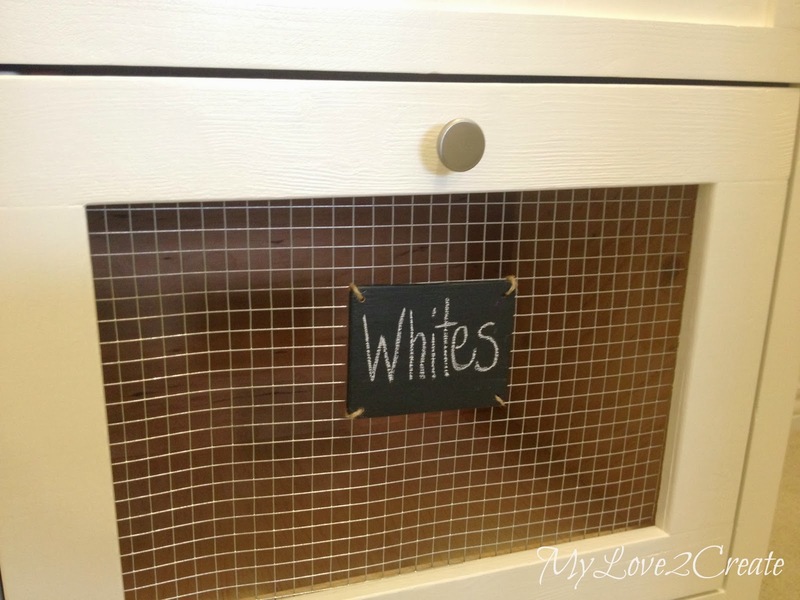 Thanks so much for sharing this with us at Sewlicious Home Decor! That looks so good! And you did it all? Kuddos to you. I'd definitely be bringing in the hubby on that one! Mindi, kudos to you for doing this awesome master closet makeover yourself - impressed the heck out of me! And that you did it for just over $300.00 is amazing! What a difference it made to your closet and I bet you are just loving it. It caught my eye over at the Give Me The Goods Party. 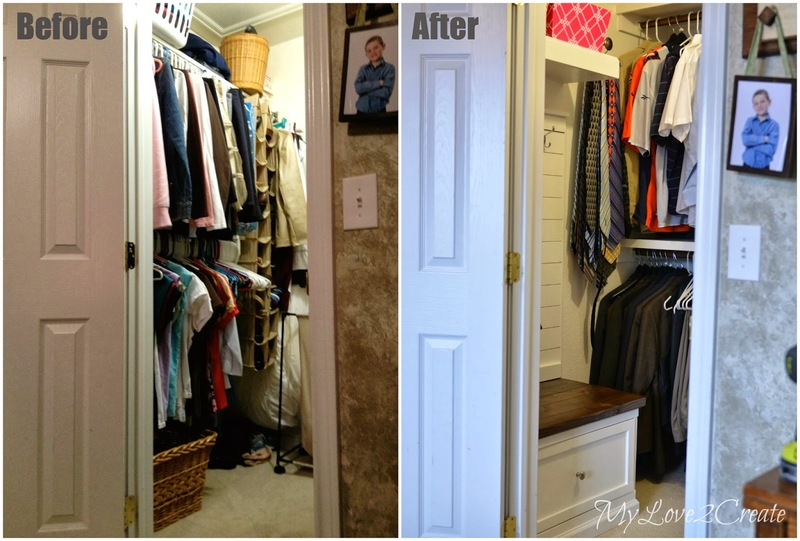 OMG your closet makeover is amazing. By adding all the shelves and bins you actually created so much more space!!! I am pinning for future reference! Wow, you did an absolutely amazing job of both constructing this yourself and for utilizing every bit of space to maximize your storage! Bravo! Well, I ma stunned..... That does NOT look like a closet: more like an entry or so.... 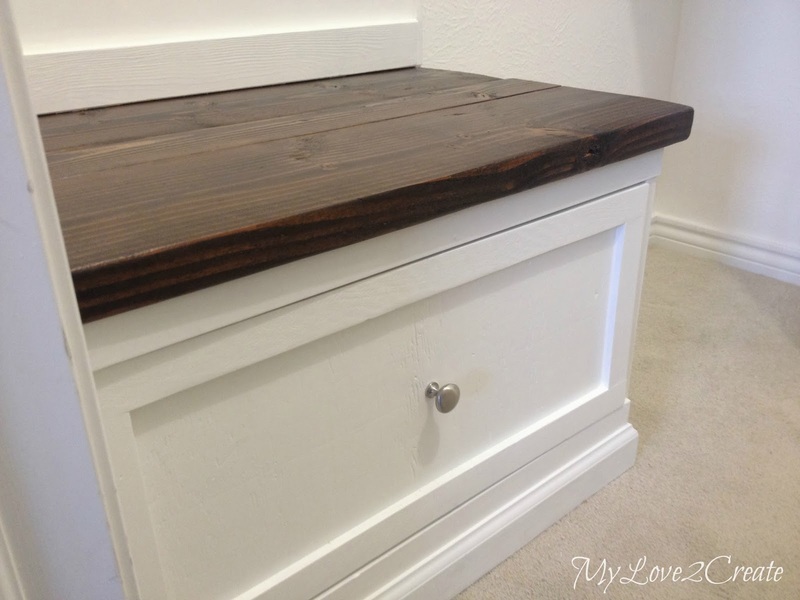 Such amazing touches and detailing... Love the plank wall, and the drawers, and the bench of course. 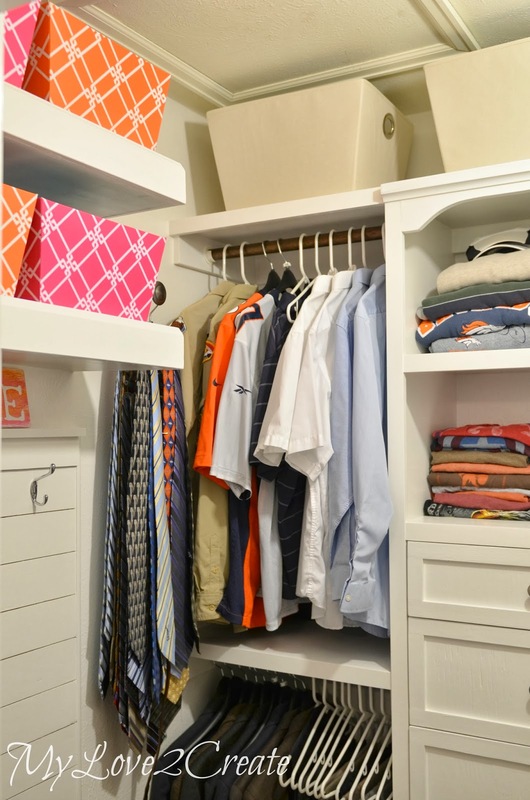 Your closet is well worth showing off!! 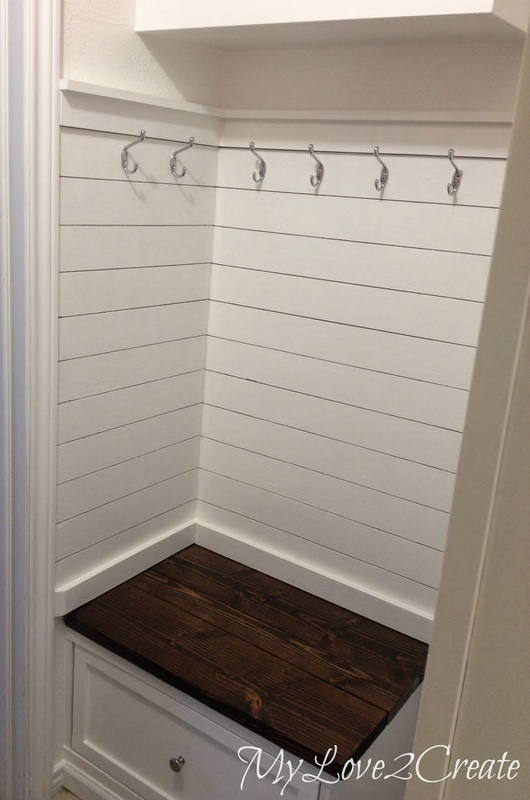 Oh, I love the great use of space in this closet, but especially the separation of whites and colors! Love love love! 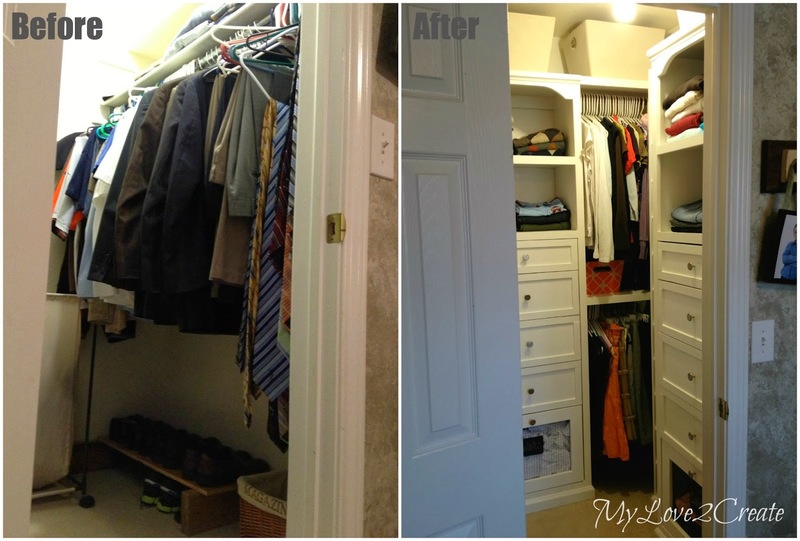 Your before picture looks like my master closet and about the same size! 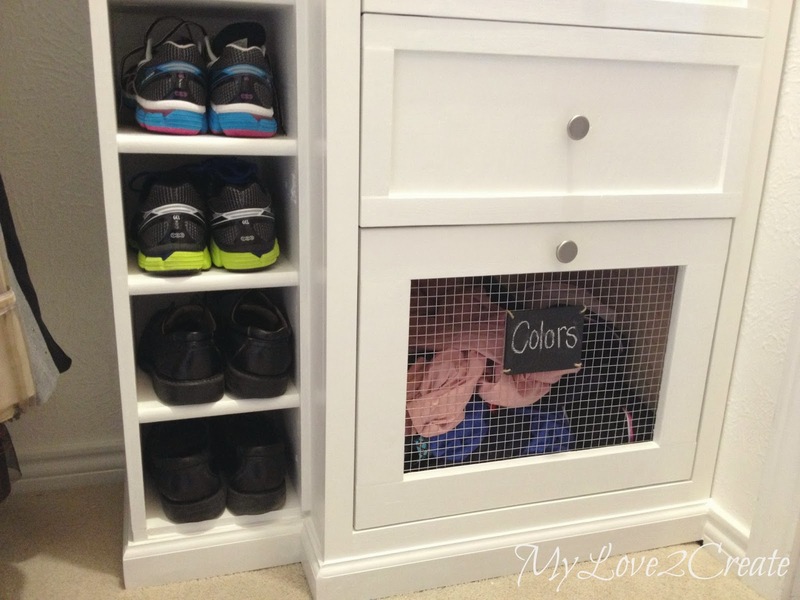 I hate our closet so this gives me something good to show the Hubs what we can do! Thanks for sharing! 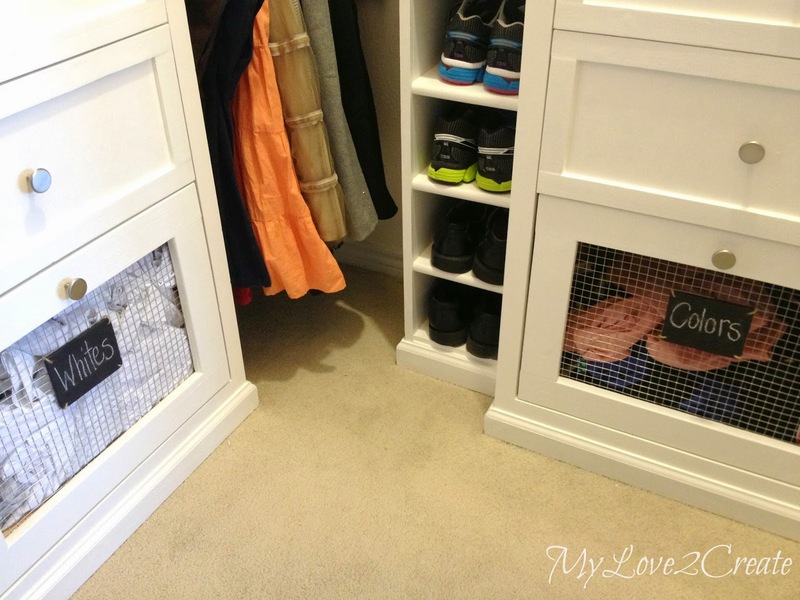 wow mindi, this is an amazing DIY. Can you come do my closet?!?!? Thanks so much for linking up at Creativity Unleashed Link Party last week. Featuring you tomorrow on the blog and hope to see you back! AMAZING, am in awe. I want to do something to my closet, but haven't worked up the nerve yet! Super Great Makeover!! Yeah I am drooling!! So glad to be featuring this at Freedom Fridays With All My Bloggy Friends!!! 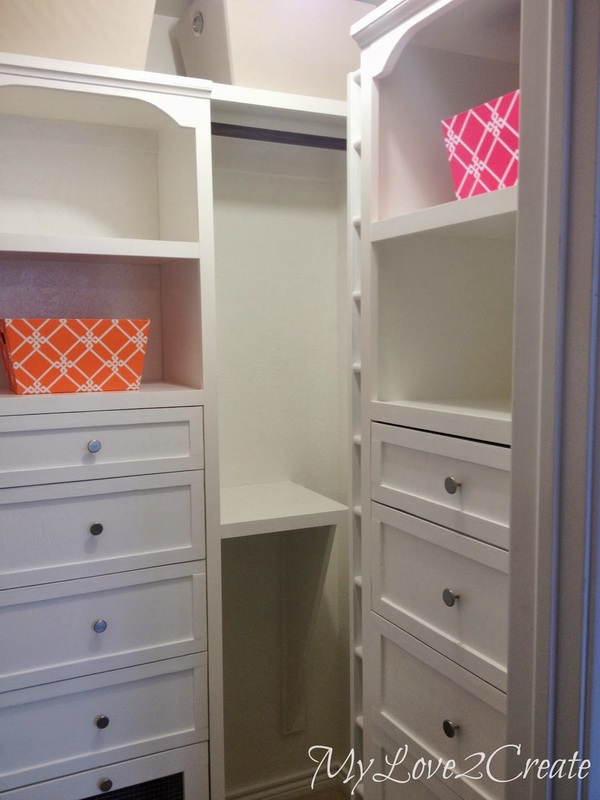 Wow, what a difference built-ins make and the fact that you DIYed it is amazing! LOVE! Thanks for sharing at The Makers and we hope you will join us again next week! So so jealous here !!!! Amazing !!!! Oops! 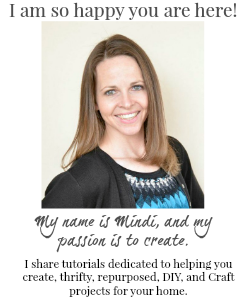 Sorry for misspelling your name Mindi! Come join the fun & share your latest projects with us again, The DIY'ers party is now live. 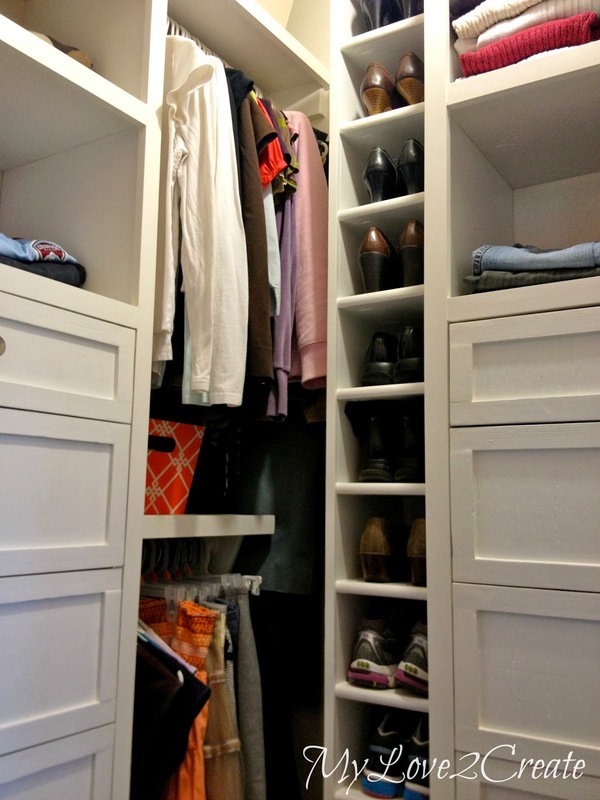 Um, I think that it is about THE most STUNNING and amazing closet I have ever seen and it you did it all yourself. WOW! Fabulous job Mindi- pinned of course!! That looks amazing! I need to redo our closet one of these days, but it is small. To even work in it I have to expand it by cutting into the wall next to it. LOVE! 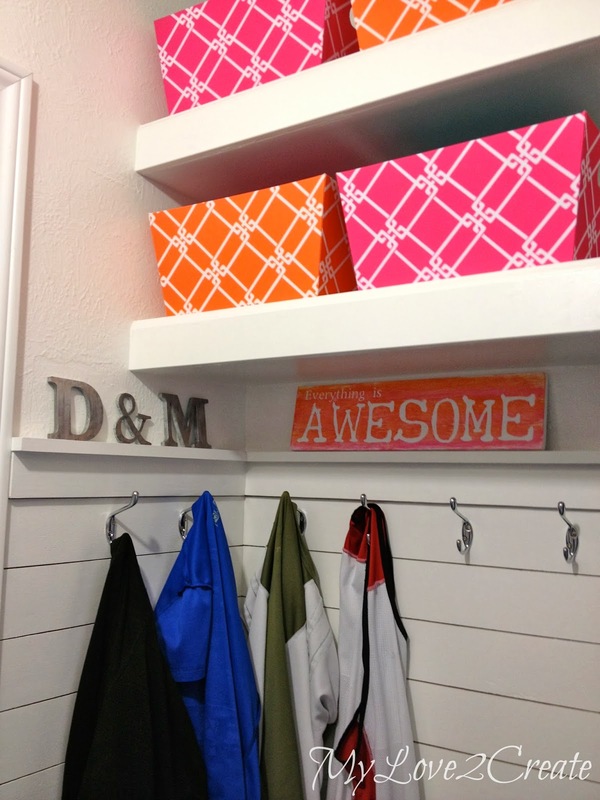 I'd love to do this to my closet... awesome job girl! I'm featuring it in this week's PoPP Spotlight. Thanks for linking up. Proud to call you my sister. It is AMAZING! Good job!!! Found you on Ryobi Nation and I love love love this. I plan to steal... um, borrow.... all your great ideas!!! This is so super cool! Very nicely done, looks professional! Can't believe it only cost around $300 to build. Well done! I am so amazed at the job you did. 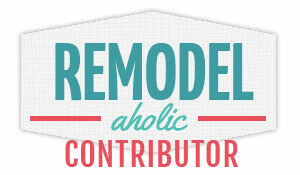 I just found your blog through a Lifehacker post but I will definitely be back for more of your great DIY projects. Now that I have seen what is possible, I might just have to try this too! Thank you so much for the inspiration! God must be a Denver Broncos fan. Why else would he have made sunsets orange and blue? This is absolutely fantastic! OK now mine. I just finished my guest room, complete with new mattress, etc. ... it's all ready for you, so you can come to CT & redo my tiny master closet. Oh wait, come in a month & we'll have the screened porch clean & ready for summer lounging. Well, there are no words! 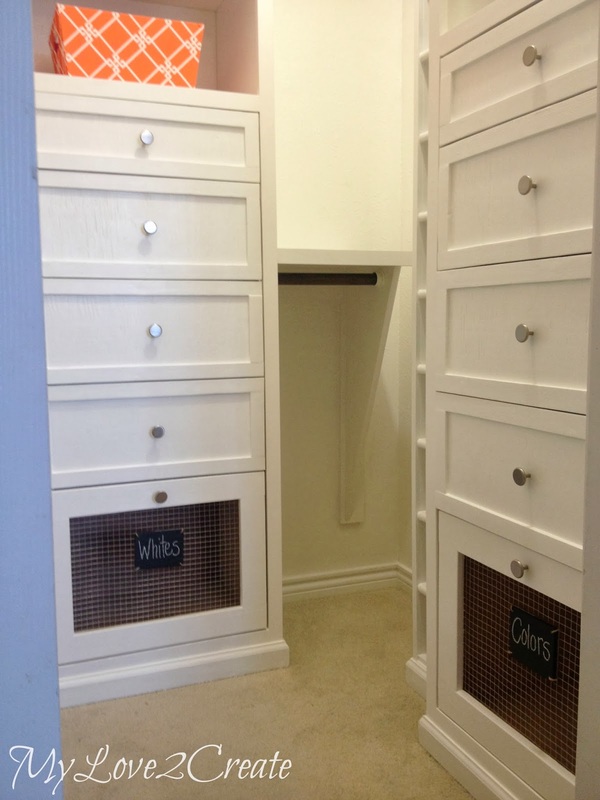 This is great...I am so proud of you, I love this new closet! Much more practical and so cute! 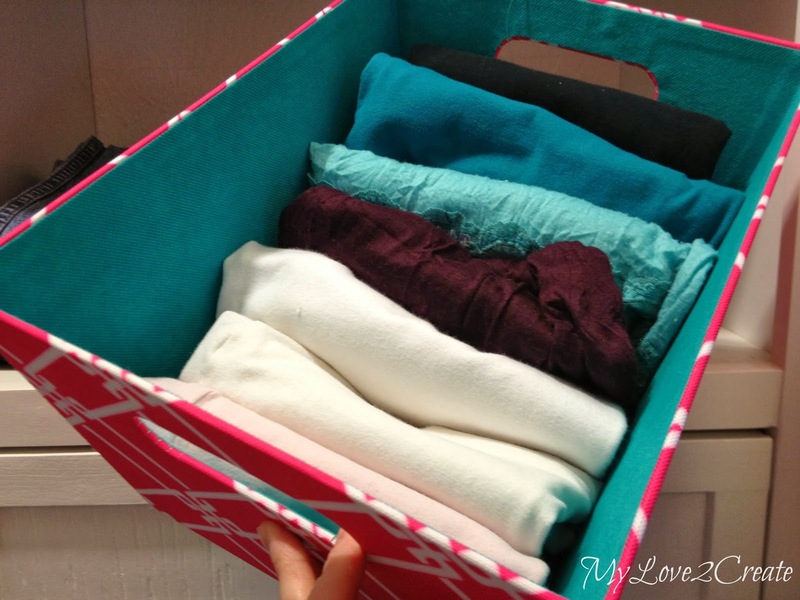 Love the hamper drawers, they are much better than my laundry baskets! Way to go, girl! Seriously. Amazing. Love, Love, Love. All of it. 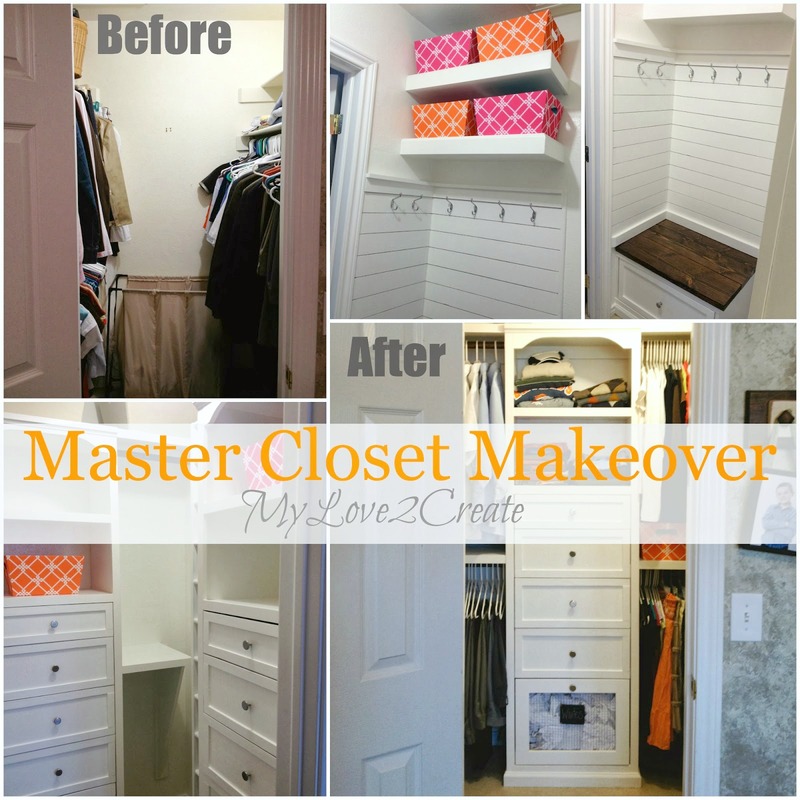 I'm a diy'er and I dream about doing a custom master closet. Thank you for jumping right in and inspiring the rest of us. I'm totally in awe that you built this all by yourself!!! You've inspired me to tackle my own closet!! I am pinning this for my closet inspiration. Fabulous! Mindi, This is awesome and you are amazing!! !